free, invoice, invoicing, tools, business, software, suite, maker, program, pdf, doc, create, creator, template, templates, creation, businesses, ster payment. The reporting functionality allows you to keep track of payments, overdue accounts, sales team performance and more. Free invoicing app for business. Generate professional quotes, orders and invoices that can be printed, emailed or faxed from anywhere with Express Invoice Free Android App. 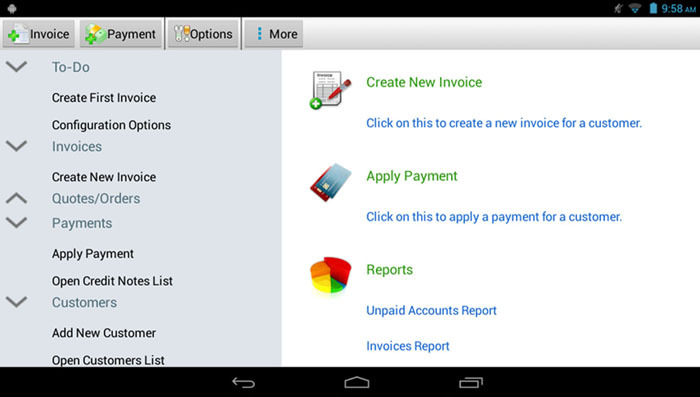 Easy app for business people on the go to create and track invoices, quotes and sales orders. Generate professional quotes, orders and invoices that can be printed, emailed or faxed directly from inside Express Invoice. Send out client statements, recurring invoices and late payment reminders to customers to keep the cash coming in. Also quickly generate reports on unpaid invoices, payments, item sales and more. Please Note: If you are currently using Express Invoice on your PC or Mac and wish to access your data, you will need to turn on the Web Access feature from the main menu in the program. Doing this allows you to set up remote access for yourself and other users from any web browser including Android mobile devices. At this time data cannot be synced directly across platforms, but Web Access eliminates the need for direct syncing for Windows and Mac users wanting to access their data on a portable device. ers with overdue payments. Supports multiple tax rates for countries where required (e.g., Canada) Supports invoicing for multiple businesses.